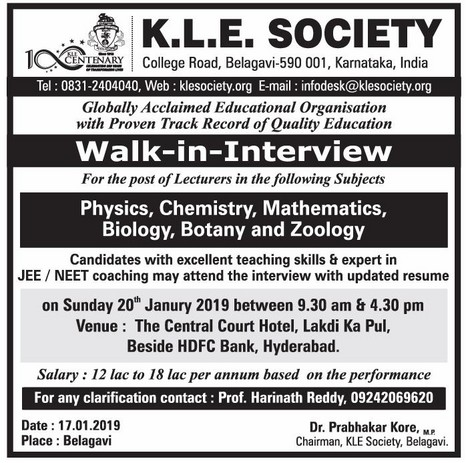 K.L.E Society, Belagavi has advertised in the EENADU newspaper for recruitment of Lecturers jobs vacancies. Interested and eligible job aspirants are requested to walk-in on 20th January 2019. Check out further more details below. About College: KLE Society is the personification of education, research and health care with a sole vision to enrich and empower individuals to become successful and responsible citizens. Candidates with excellent teaching skills & expert in JEE / NEET coaching are required. How to Apply: Interested and eligible candidates are requested to attend the Walk-in interview by bringing their CV along with originals & copies of certificates and recent PP size photos to the walk-in address provided below.